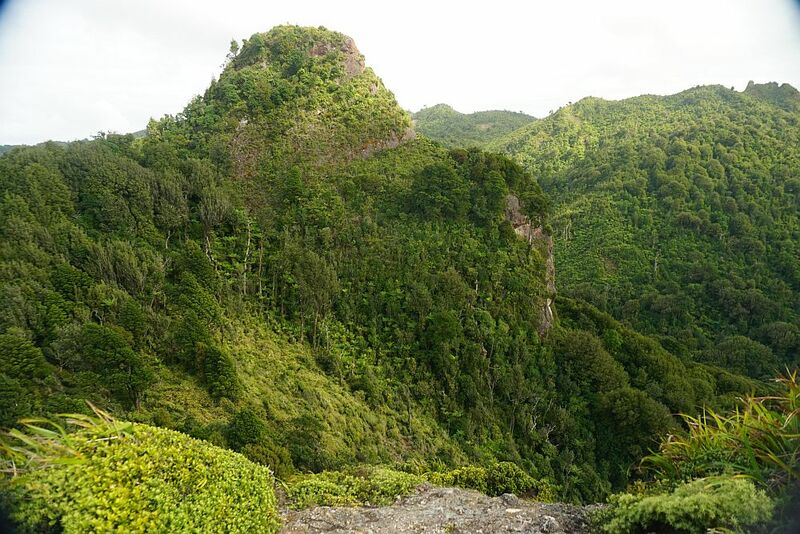 Although it is now considered too dangerous to climb Sentinel Rock, a large rocky outcrop in the Kaimai Mamaku Forest Park, it is still possible to view the rock and surrounding valley from a nearby lookout. There are also views to the Pacific Ocean and parts of the Bay of Plenty. The track to the lookout starts at the end of Hot Springs Rd, just south of Katikati. 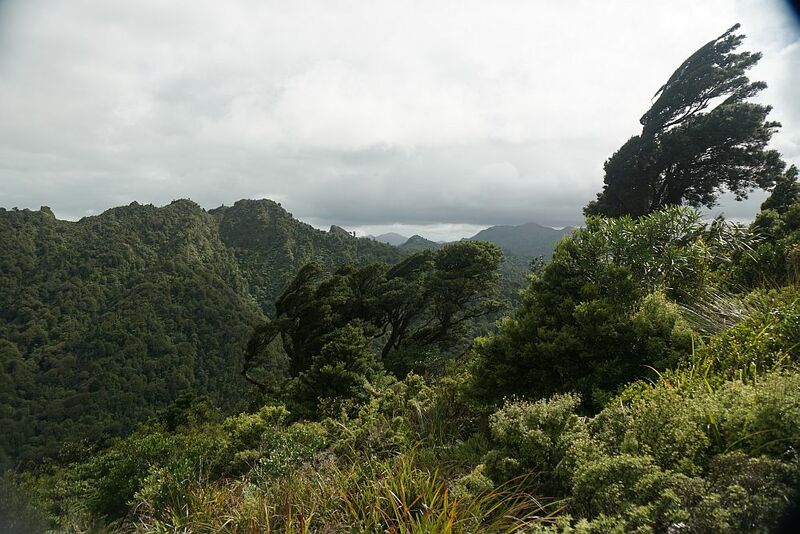 The Tuahu Track and Tuahu Kauri Loop Track lead past two of the largest kauri trees in the Western Bay of Plenty, to the start of the Sentinel Rock Track. There is a parking area and information panels at the end of Hot Springs Rd, but no toilet facilities. The Tuahu Track continues across the Kaimai Range, ending on Wairakau Rd on the western side of the range. On the eastern side of the range the track is wide and well formed, and a good walking track. 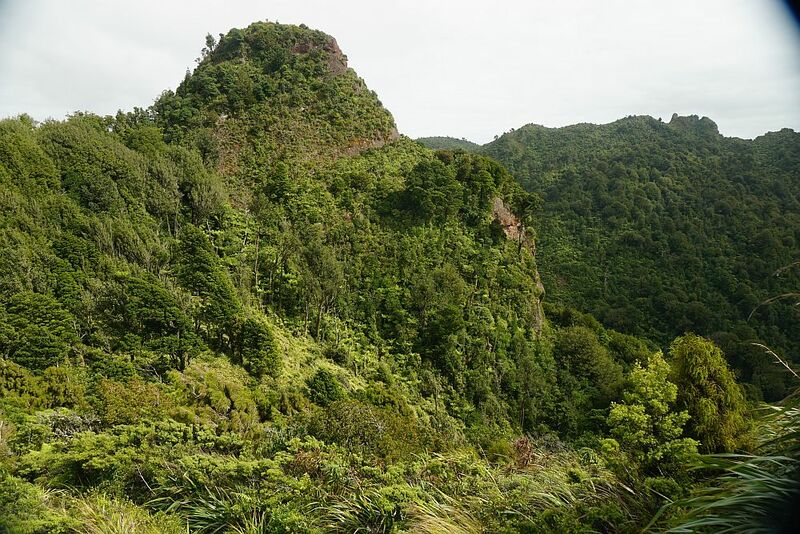 After an easy walk of about 25 minutes or 1,5km from the start of the Tuahu Track there is a short loop track, well signposted and with a few steps, leading to the two large kauri trees and the start of the Sentinel Rock Track. The Sentinel Rock Track is rough in places, with some of the orange triangle pointers disappearing in the vegetation. The track continuing on from the lookout sign is not marked at all, and does not appear to be maintained, but is quite easy to follow. There is a sign indicating that the final piece of track to the rock itself is not maintained, and is too dangerous to be used. There is some information about the Sentinel Rock Track on the DoC web site. 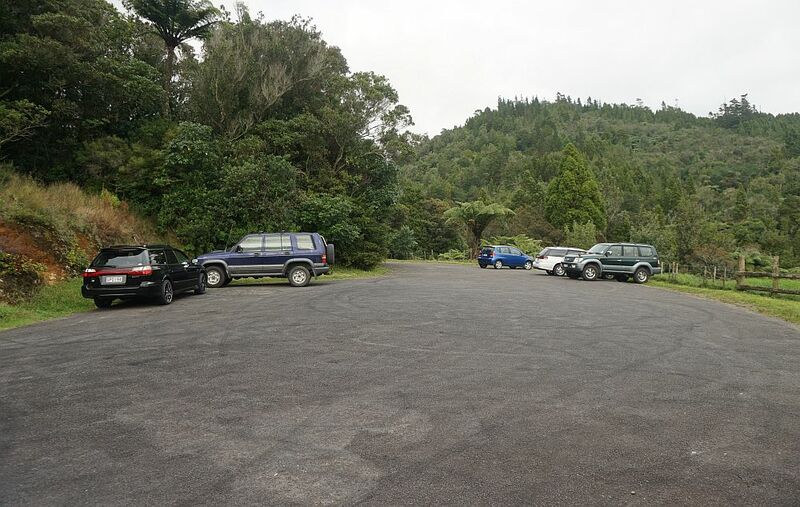 The parking area at the start of the Tuahu Track. 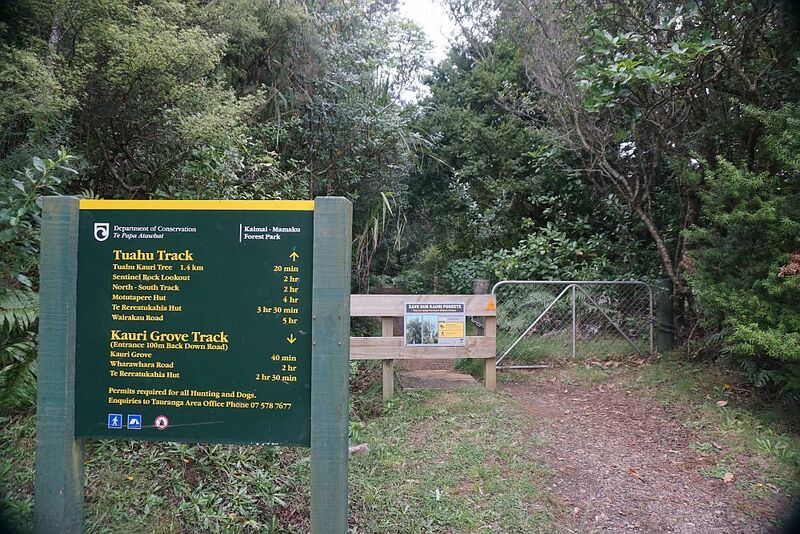 Information panels at the start of the Tuahu Track. 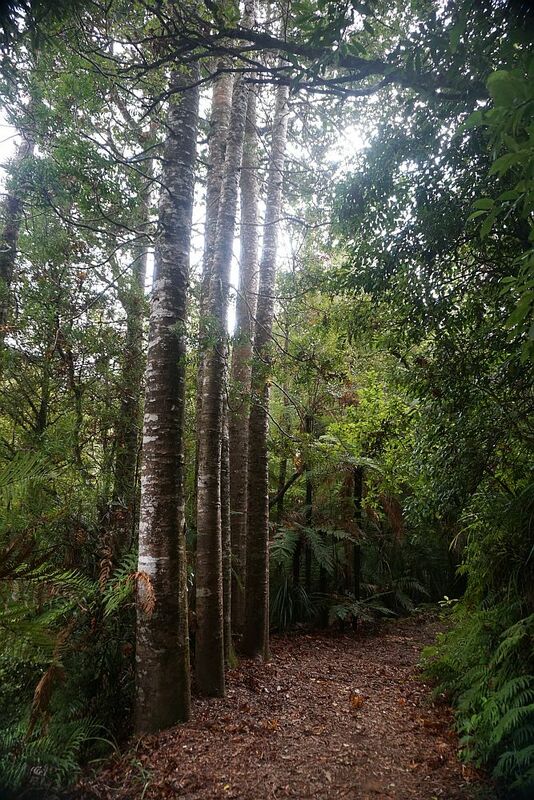 Young kauri trees alongside the Tuahu Track. 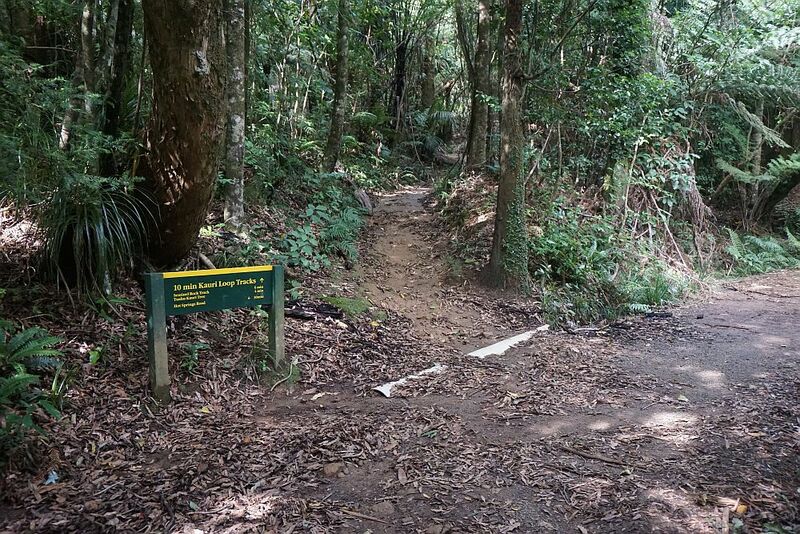 In an attempt to limit the spread of kauri dieback disease there is a boot cleaning and disinfectant station near the start of Tuahu Track. The short Tuahu Kauri Loop Track branches off the Tuahu Track. 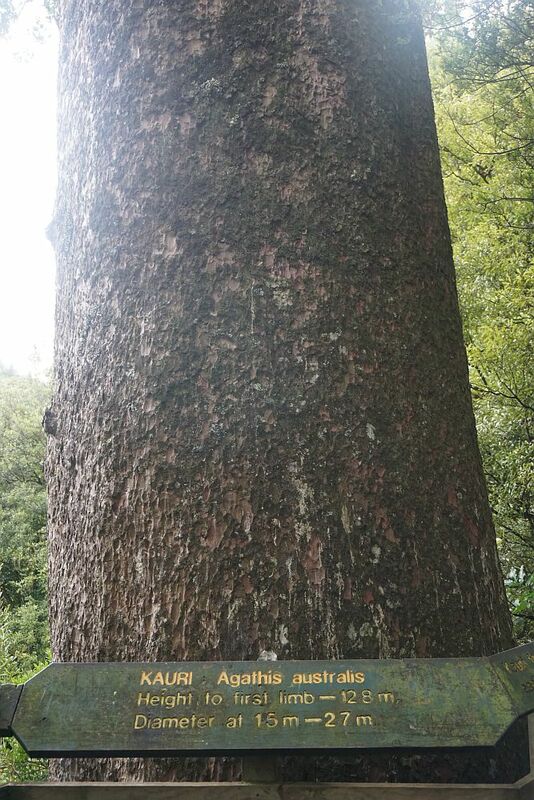 The base of the largest of the two kauri trees with some information about the tree. 12.8m to the first limb, and a diameter of 2.7m at a height of 1.5m. The trunk is too large to hug, but it’s possible to give it a pat. The smaller of the two kauri can be seen to the left. 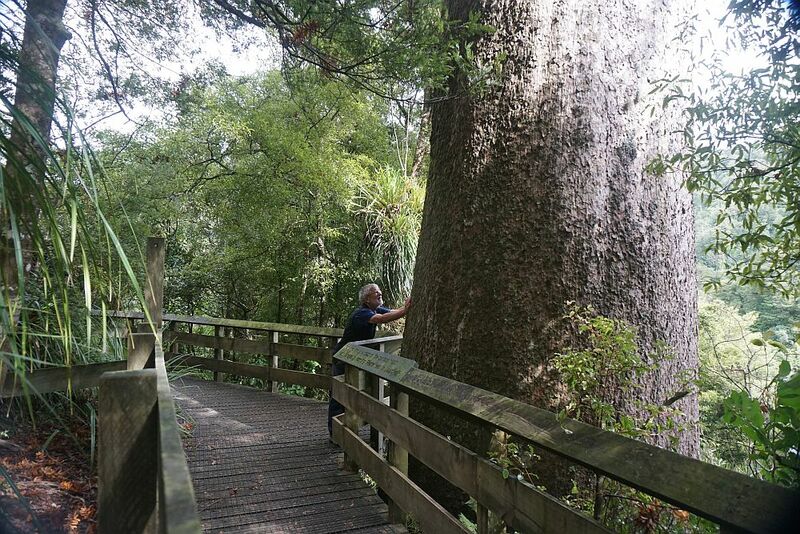 The walkway protects the kauri tree roots from being trampled on. 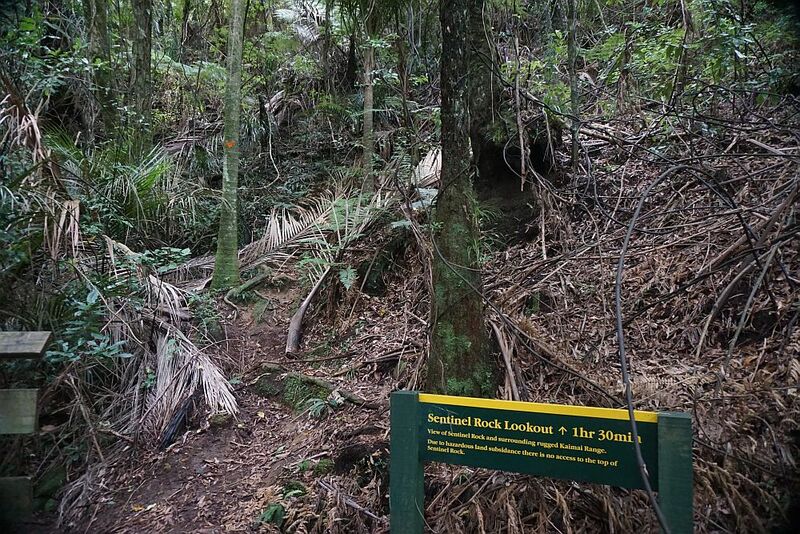 The Sentinel Rock Track starts at the end of the boardwalk past the kauri trees. 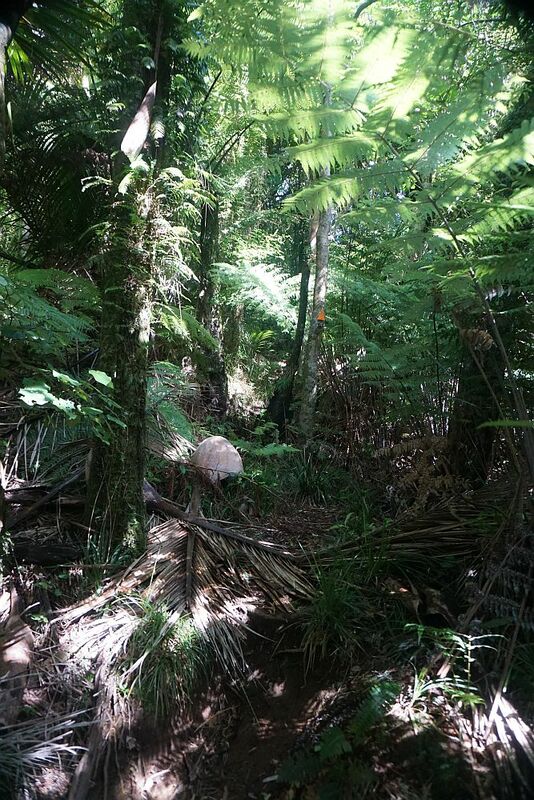 Nikau palm leaves cover the track, which continues up the hill. The initial part of the track is quite steep, with only a few formed steps,but later levels out and follows a ridgeline towards Sentinel Rock. Sentinel Rock seen from the lookout. The track continues to the left past the sign to another lookout about halfway to the rock itself, but this part of the track is not marked and is apparently not maintained. However it is probably still used for pest control, and is easy to find. 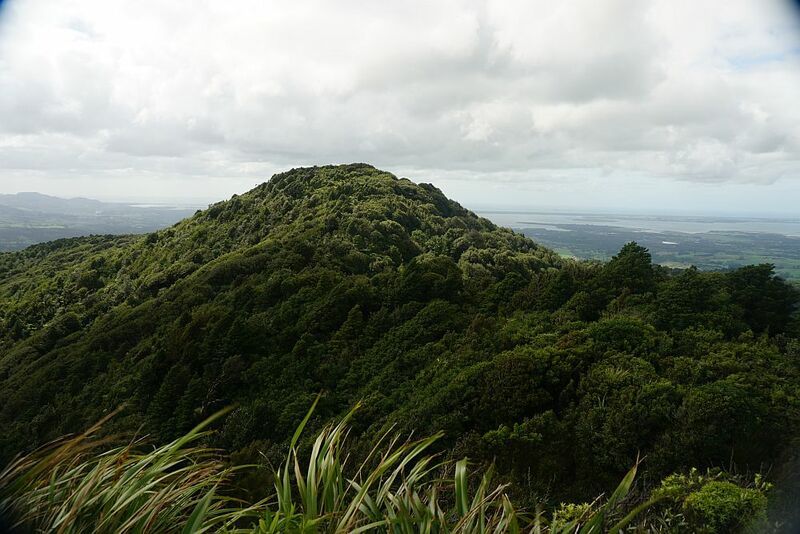 The peak of Mt Te Aroha can be seen in the distance, through a gap in the Kaimai ridgeline. The prevailing wind direction is obvious at this point. Looking towards the east from the Sentinel Rock Lookout. Unfortunately visibility was not ideal on the day. 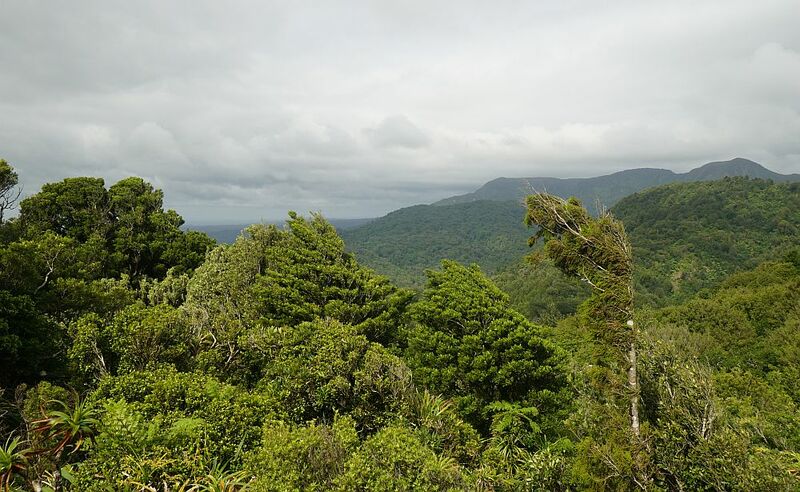 There are interesting formations along the Kaimai Range ridgeline, seen from the Sentinel Rock Lookout. The sign indicating the end of the maintained track and the dangers present in the continuation to Sentinel Rock. Sentinel Rock seen from the sign indicating the end of the maintained track. Just before reaching the end of the maintained track there is a short branch track to the top of what appears on some maps as Little Sentinel Lookout. It’s a rocky outcrop with steep dropoffs, but with good views to the coast. Sentinel Rock seen from Little Sentinel Rock Lookout. Views to the coast with the Coromandel Peninsula to the left and Tauranga Harbour to the right. The official Sentinel Rock Lookout is at the summit of the ridge in the centre. 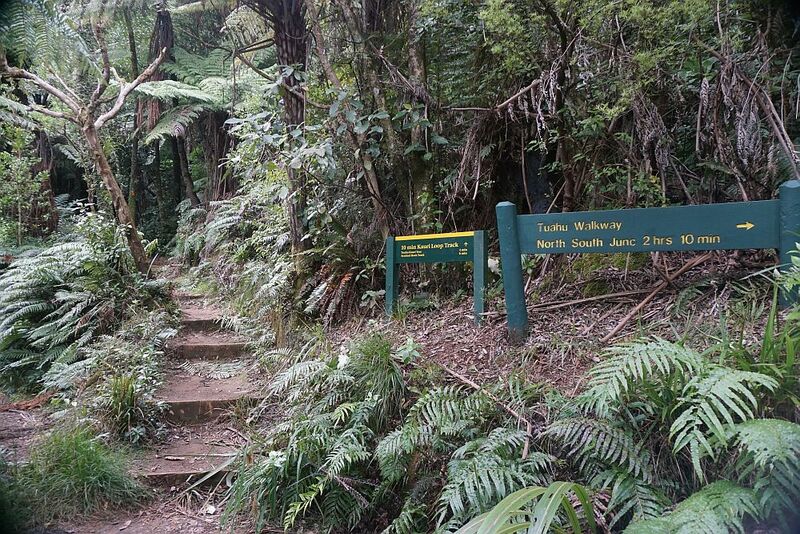 There is no alternative track, so the same track is followed back to the Tuahu Kauri Loop. 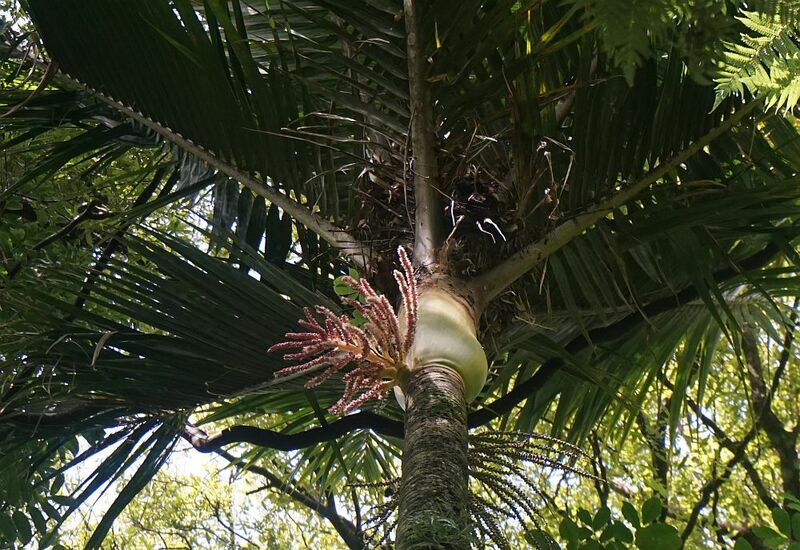 Nikau Palms are found almost all the way along the track, with their leaves covering the track in several places. 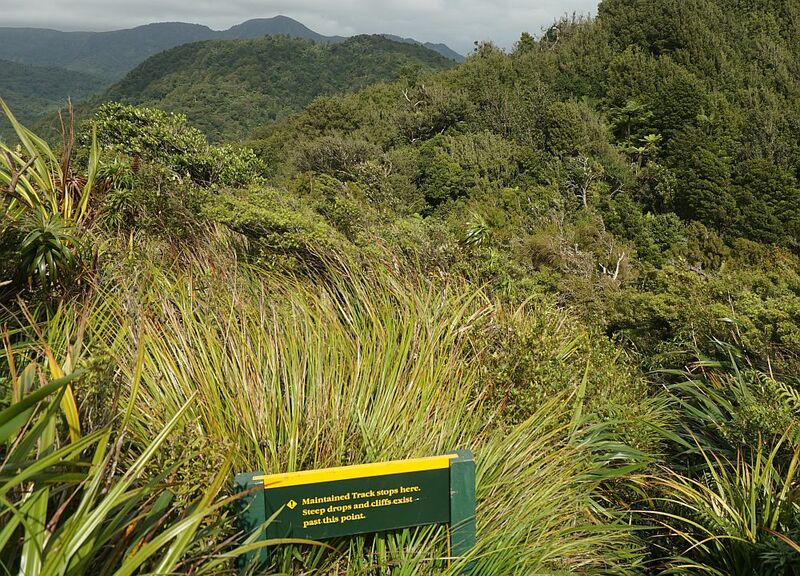 The sign at the upper end of the kauri loop track. 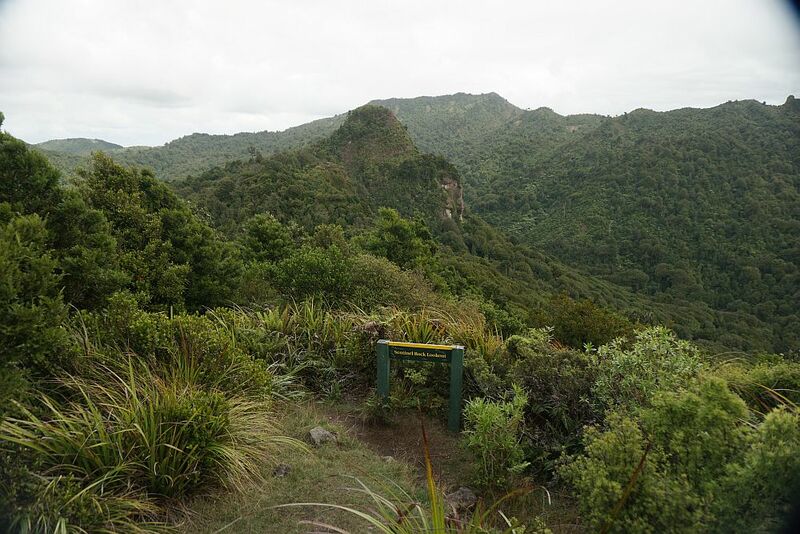 The Tuahu Track continues to the right, to the top of the Kaimai Range. The Tuahu Kauri trees are about 1.5 km from the start of Tuahu Track, at the end of Hot Springs Rd, and the walk each way takes about 25 to 30 minutes. 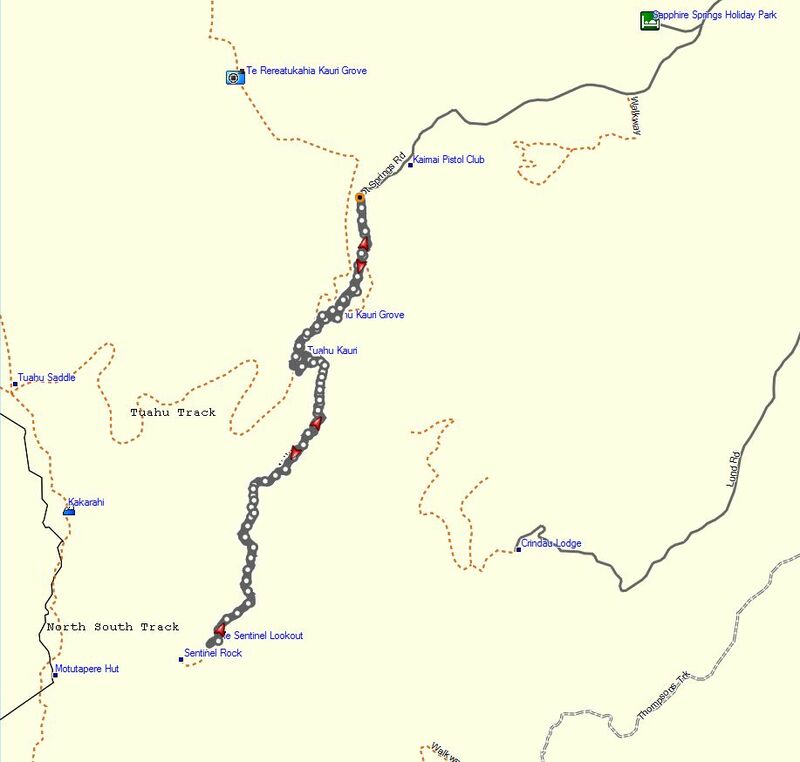 The total distance from Hot Springs Rd to the end of the Sentinel Rock Track is about 4 km, or 8 km for the total walk. Total time was about 3 hours 30 minutes, including time for taking photos and for a quick lunch. The GPS log shows the route taken and the location of the Tuahu Kauri, Sentinel Rock, and Little Sentinel Lookout. The parking area is about 175 m above sea level, and the highest point of the track, near the lookout, is about 550 m asl. The track was walked on April 12, 2015. 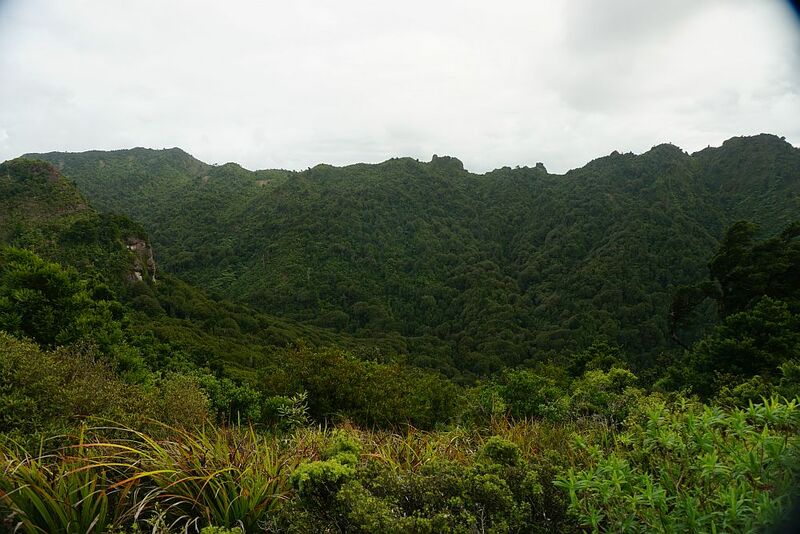 This entry was posted in Walks and tagged Kaimai Mamaku Forest Park, Kaimai Range, Katikati, Kauri, Sentinel Rock, Tuahu Track on 2015-04-14 by nzartig.